This lemon cheesecake recipe calls for the cheesecake to be baked in a rectangular baking dish and cut into squares. You can also put it into a round springform pan. Just make sure to cook it longer as the filling will be thicker. In a mixing bowl, cream shortening and brown sugar. In another bowl, combine the flour, oats and salt. Gradually add the mix to the creamed mixture. Press the dough into a greased 13"x9" baking dish. Bake for 15 - 18 minutes or until golden brown. Spread the crust with jam. Beat the cream cheese, sugar and flour until fluffy. Add the eggs, lemon juice and lemon zest just until blended. Carefully spoon the filling over the jam. Bake for 30 - 35 minutes or until center is almost set. Test for doneness with a toothpick or cake tester. Cool on a wire rack. If you will not be serving the cheesecake soon, cover it and store in the refrigerator. Makes up to 20 servings. Baking the dessert in the rectangular pan makes it a great take along dessert for pot luck dinners, or a wonderful addition to a dessert table. Serve large individual pieces topped with fresh fruit, fruit pie filling or top it with our lemon sauce for a real lemony treat. The strawberry or raspberry preserves are optional. 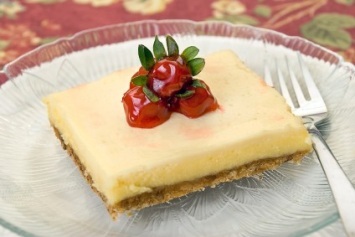 You can leave them out but they do add a nice fruity taste to the cheesecake squares. This is a baked cheesecake recipe, but it doesn’t come out dry at all. This lemon cheesecake recipe is perfect for entertaining or buffets. You can easily cut it into smaller squares and put them on a dessert platter with other squares and desserts. Perfect for holiday entertaining. If you like this recipe, I’d love you to Pin it to Pinterest, Tweet about it, Like it on Facebook and leave a favorite recipe below. Our lemon cheesecake recipe is just one of our delectable cheesecakes. Look here for our chocolate cheesecake.